Join the some thousands of casino player, that prefer Red Tiger slot machines. 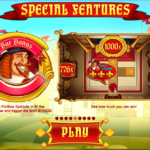 Now we are going to introduce You the Three Musketeers slot machine. Let’s start there, that You can test your luck on this slot machine in Unibet and EnergyCasino. Compared to the X2000 prize, it might be surprising at first, that this slot machine have only 40 winning lines. If You have played with many casino games so far, exactly knows, that such high prizes are usually offered by slot machines containing 243 or even more winning lines. So You should not look down on the Three Musketeers slot machine, while if You keep on reading, You will find out, how great slot machine is it with its 40 winning lines. Did You know, that Red Tiger slots contain daily jackpots? Like any other RedTiger slot machines, the Three Musketeers slot machine also has daily jackpot. These are always won by somebody in the end of the day. Moreover, in order to always check it, a clock is represented on the left side of the slot machine, where the supposed time of winning the jackpot is clearly visible. Of course it is not guaranteed, that jackpot is won by that person, who is playing when the clock reaches zero, but it might also be a big help. If You see that there isnot much time left, let’s say one-two hours, then it is worth to keep on playing. 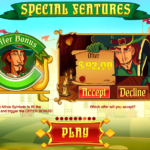 What SPECIAL FEATURES are available on Three Musketeres slot machine? If the OFFER SPECIAL FEATURES have begun, then we take part in a game similar to ‘Deal or no deal’. In this case, a musketeer (instead of a banker)offers maximum 3 options, which we may accept or deny. Obviously, if we have denied the second deal, then the third one is automatically accepted. 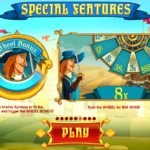 If we have managed to win the WHEEL BONUS SPECIAL FEATURES, then a luck wheel appears in front of us, which may be activated by pressing the ‘spin’ button. There are instant prizes there, but we may win further free spins, if the wheel stops in the good moment. This way we may spin several times, resulting in further prizes. Probably this is the most valuable special feature at Three Musketeers slot machine. When it is activated, we found ourselves in a room, where we might win even the X1000 of our bet. To achieve this, we must reach the third room. There are obviously smaller prizes in the first and second rooms. So try to reach the third one as soon as possible. 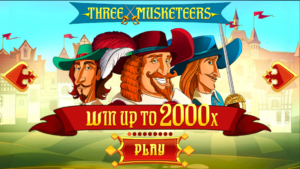 We hope You also liked this Three Musketeers slot machine, like other Red Tiger slots. Please share the article with your friends. We wish You good luck! Play real money! More casino� top10casinoreviews.com. April 9, 2016, No Comments on Cleopatra’s Choice slot machine will mesmerize you!